Better for the Horse. Better for the Rider. Give your horse’s the best comfort with ThinLine Pads. 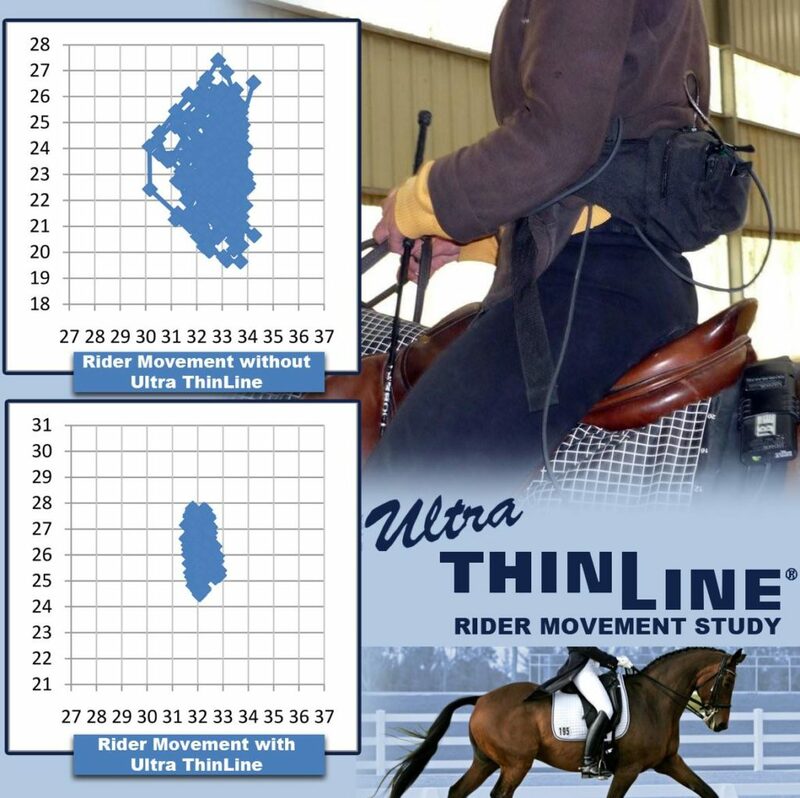 ThinLine Pads offer over 90% shock absorption between horse and rider. This impact comes from the rider sitting onto the horse’s back as well as the horse’s back lifting into the rider’s seat. By decreasing these opposing forces, this allows the horse to move more fluidly and a smoother seat for the rider. ThinLine is the only product endorsed by spinal surgeons, in addition to the recommendation of Veterinarians, chiropractors, saddle fitters and massage therapist. ThinLine gives riders a closer, quieter connection. The shock absorbing health benefits coupled with fixed soft contact produces better riders and happier horses. Money Back Guarantee. Beginning as a liquid, open cells are poured then polarized so each cell lies end-to-end. Another layer is poured then polarized in a new direction. This process is repeated hundreds of times in order to create a honeycomb matrix formation that allows impact and heat to move laterally. The end result is that impact moves ACROSS the ThinLine pad, which produces a completely different ride your horse will love. Riders will also love how the open-cell technology transfers recoil off the horse’s back laterally rather than directly up into the base of the rider’s spine. Due to the open cell process, the ThinLine material is 100% breathable and will not trap any heat or moisture between your tack and your horse. Allowing your horse’s skin to be as comfortable as possible during training. The nonslip shims are also made of this exclusive protection foam, can create a perfect saddle fit. The shims can even be stacked 3 times with out any slip between the shims and the saddle pads. It all stays where it needs to be. Integrity and softness of ThinLine allows saddle pads to flex and stretch over high withers and weak top lines without bottoming out like memory foam, or moving, like gel. The suppleness allows for a custom like fit in the exercise boots, and complete comfort in our girths and cinches. Body temperature warms the ThinLine material allowing it to conform to the horse to support tendons and muscles, and relieve pressure and impact. When returned to room temperature, 75° F, it rebounds to its original shape. The lifespan of the basic ThinLine product is typically 7-9 years. We have seen ThinLine Basics Saddle Pads lasting decades. ThinLine moves impact laterally instead of up into the rider’s spine. Thus reducing back strain, providing protection for spines, improving equitation and a close contact while maintaining custom saddle fit. With so many different options of saddle pads it gets overwhelming to find the right pad for you are your horse. For English Riders, we recommend starting with the ThinLine Trifecta Half Pad. This pad has shimmable pockets or if used alone will not alter your saddle fit. For Western Riders, we love the Premium Pro-Tect Saddle Pad. This pad is made of high-content virgin wool allowing a hard working, flexible and comfortable pad for your horse. For developing a better topline, Master Saddlers find results with ThinLine. So many horses improve top-line muscle tone by using ThinLine Master Saddlers such as Cordia Person (CSF) educate saddle fitters on how to shim with ThinLine Plus. For custom saddles, fitters like Cordia, recommend Basic Ultra ThinLine Pads to protect backs and keep saddles fitting until the next check. Ultra ThinLine will not alter the fit of a custom saddle. ThinLine can be a solution for equine sore backs. Often the culprit of poor saddle fit, sore backs are one of the primary reasons for soundness issues. Veterinarians recommend ThinLine for horses with sore backs and as a preventative measure and as part of their therapy. Burlington Equine Veterinary Services VT: specializing in KSD Kissing Spine Disease treatment, among others recommend the Therapeutic Pad. ThinLine is the only saddle pad endorsed by Veterinarians for Kissing Spine. Confused about the difference between the Ultra ThinLine and the ThinLine Plus? A simple break down is the thickness of protection of the ThinLine foam. The Ultra Thinline is 3/16″ compared to a 1/4″ thickness of the ThinLine Plus. Learn more from our ThinLine Ride article. It is important to take proper care of your ThinLine Tack to ensure its longevity. Keep your ThinLine pad away from chemicals such as ShowSheen, oils, and leather conditioners. Read more under our Tack Care Section.